As we conclude the 2016 academic year, it is important to reflect on the exciting and programs that have been implemented during the year. At St John’s Junior School, the child is firmly at the heart of our work. We seek to develop the whole child by providing students with meaningful and connected learning experiences. It is with this in mind that programs this Semester have focused on developing imagination, creativity, fitness and pastoral care whilst in the context of academic rigour. The Live Life Well @ School program has provided a broad platform for a variety of fun and engaging activities throughout the year. The school garden, daily fitness, our amazing bike track and a ‘well-being’ focus, all combine to develop happy and healthy young learners. The excitement of our students when first experiencing a race around the bike track is a wonder to behold. This activity teaches them not only about bike safety but also the need to share a collaborative space with peers, whilst ensuring that all riders are safe and follow the rules. Creativity and innovation has driven our STEM activities this Semester. STEM stands for Science, Technology, Engineering and Mathematics. Participation in Science enrichment activities, UNE Stem workshops with Professor Mary, Far Out Science, the Discovery Bus and mathematical investigations have engaged the curiosity of our boys and girls within the framework of academic fields. Exploration of the fraction wall, creating games, developing strategies for learning tables and an A-maze robotic program educate our students about the relevance of school to the real world whilst having fun. St John’s is a very special school community. It has an active and supportive P&F, strong community support, committed, highly experienced and talented staff and superb student leaders. I feel very fortunate to be a part of such a wonderful school. I wish everyone a happy Christmas and a restful holiday period. 2017 is going to be an amazing time of growth and development at St John’s. 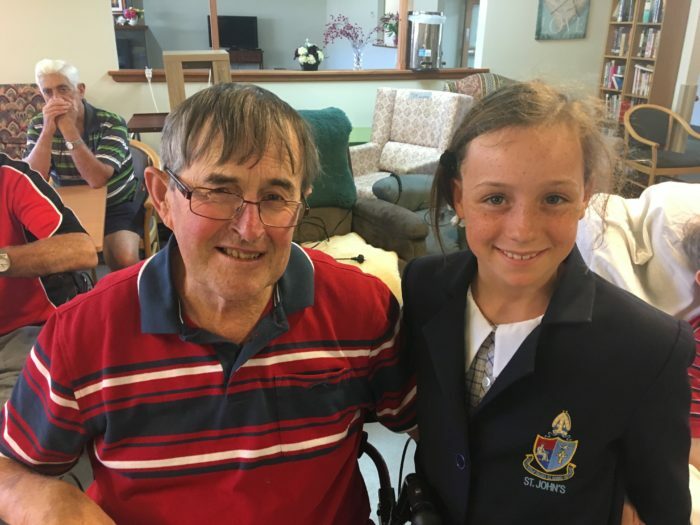 As part of St John’s growing Service –Learning programme, students from Year 5 and 6 participated in a collaborative pen pal writing program with Autumn Lodge Nursing Home and Ken Thompson Lodge. Students have written letters to a resident identified as being interested in our program. The diversional therapists at these facilities believe that the residents gain a great deal from interacting with our students and it has brought joy to the residents’ lives. 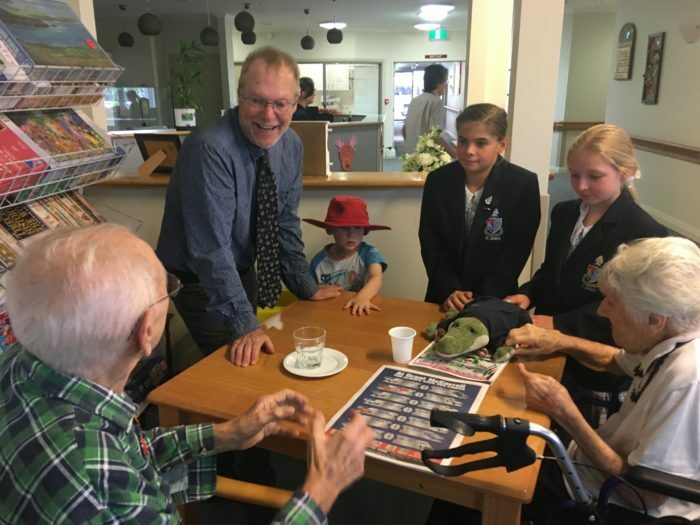 The students of Year 5 and 6 have had the opportunity to meet their ‘adopted grandparents’ when their classes visited the care facilities recently to perform some Christmas musical items and to share some of the work they had created throughout the year. 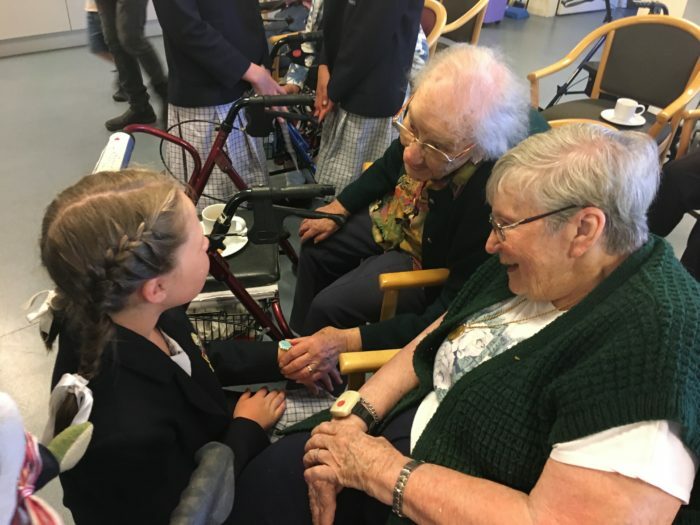 We believe that the students benefit greatly from the time and energy given to these projects and will develop a better understanding of elderly members of our community and of their own ability to bring joy to others. St John’s is a community that gives. The response to our appeal for the Armidale Care Van has been extraordinary. We hope that the discussions at home have been enough of a reward for why we do these things. I know many homes have also had some interesting Personal Development discussions about women’s hygiene products. This is all a part of growing up and an added bonus to the Christmas spirit at St John’s. Activities Day 5 December at St John’s! Activities Day is a tradition that has been held at St John’s for many years. It is a celebration of the children’s efforts throughout the year and is a fun and relaxed way for teachers and students to enjoy time together. This year we will be running activities at school throughout the morning and then a NEGS and St John’s sports afternoon. Teachers are planning drama games, cooking and craft workshops. It will be heaps of fun. We hope to also raise some much-needed funds for Red Cross by asking for a gold coin donation. Also proceeds will be given to this worthwhile charity. Christmas is around the corner and what better way to celebrate than to have a red mufti/dress day at St John’s to help raise funds for Red Cross. By dressing in red on Activities Day, our school can help bring hope to thousands of families who are in desperate need of help this Christmas. From isolated elderly Australians, to families struggling to make ends meet and communities affected by disasters, a school fundraiser will help to make sure Red Cross is there.